After showing a striking ignorance of, and disinterest in, foreign policy during his presidential run in 2016, Sen. Bernie Sanders (I., Vt.) is making amends. The senator is now trying to portray himself as the left-wing leader of international affairs. Since losing the Democratic primary, Sanders hired his first Senate foreign-policy adviser (and now has a team of advisers), led the legislative push to end American support for Saudi Arabia's war in Yemen, and delivered two major speeches on foreign policy—one in 2017, the other last year. Now that Sanders is again running for president, it seems that, with each new week, another magazine is publishing an essay on how his "progressive" foreign policy would revolutionize America's role in the world. 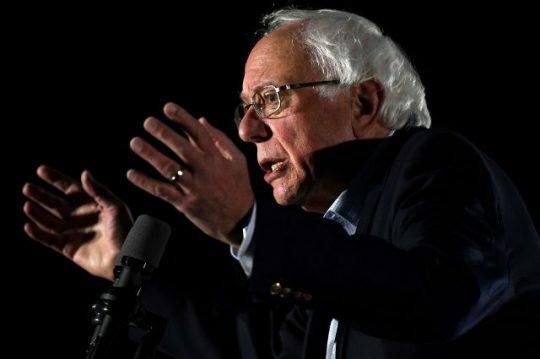 Throughout this whirlwind of speeches, profiles, and interviews, Sanders has stressed one main theme: a growing dichotomy between authoritarianism and progressivism. "Right-wing authoritarians backed by a network of multi-billionaire oligarchs are forming a common front," Sanders tweeted earlier this month. "We who believe in democracy must join together to build a progressive global order based on human solidarity." Using slightly different wording, Sanders has repeatedly warned of the "rise of a new authoritarian axis," and called on supporters to "reconceptualize" a new world order that "mobilizes behind a vision of shared prosperity, security, and dignity for all people, and that addresses the massive global inequality that exists." This rallying cry, as vague as it is ambitious, appeared over the weekend in yet another article on Sanders's worldview. The New Yorker published a piece titled, "Bernie Sanders Imagines a Progressive New Approach to Foreign Policy," in which the author, Benjamin Wallace-Wells, examines the senator's views on international affairs. "When I talk about income inequality and talk about right-wing authoritarianism, you can't separate the two," Sanders said, describing a world in which Wall Street, multinational corporations, and authoritarian leaders are collaborating to corrupt politics everywhere. Many foreign-policy hawks would actually agree, in general, with Sanders's dichotomy—at least the need to counter authoritarianism in the name of freedom. In fact, none other than Robert Kagan, a senior fellow at the Brookings Institution and an unapologetic defender of exerting American power abroad, wrote an important essay last month for the Washington Post on authoritarianism reemerging as "the greatest threat to the liberal democratic world," both as an ideological and strategic challenge. There is clearly an authoritarian axis of sorts in the world that opposes liberal democracy. Just look at how dictators across the globe—from Nicaragua, to Turkey, to China—announced their support for Venezuelan strongman Nicolás Maduro when Venezuela's political crisis began, while dozens of democracies labeled him an illegitimate leader. So Sanders's foundation is basically sound. His conception, however, is problematic for two reasons: he overly politicizes the dichotomy, rendering it meaningless, and his prescription for dealing with the problem is deeply misguided. Unlike Kagan, Sanders consistently identifies the threat as "right-wing authoritarianism," not just authoritarianism. The senator is either being willfully blind or using the label "right wing" to assuage his left-wing supporters. What about Maduro's government, which is blatantly socialist? Wallace-Wells actually asked Sanders whether Maduro is part of the axis of corrupt authoritarianism. "Yeah," the senator said. "It is a failed regime. From all of the recent evidence, it appears that the election was fraudulent. And, despite his ideology, what we need to see is democracy established in Venezuela. That does not mean deciding that some politician is the new president, who never won any election." So is Maduro a right-wing authoritarian or just an authoritarian? Is there such a thing as a left-wing authoritarian? What about the Chinese Communist Party? The point is that such distinctions are stupid and miss the point: that the authoritarian threat transcends traditional political divisions, coming from and hurting both the left and the right. The real split should be between free and not free, liberal (in the classical sense) and not liberal—that is a more unifying message to the democratic world, not political labels. Sanders does not believe America is a moral country. He only sees the mistakes, and is happy to describe American foreign policy in a way that would make Berkeley's faculty blush. "We cannot speak with the moral authority the world needs," Sanders said, "if we do not struggle to achieve the ideal we are holding out for others." Sanders believes the American economy is immoral, and also believes American foreign policy is a form of malignant imperialism. In Sanders's worldview, the role of the United States is to help organize the international table at which all countries sit to discuss a given issue, not to exercise meaningful, decisive leadership—which often, in a harsh and unforgiving world, requires coercive power against adversaries, in concert with allies. Sanders's proposals are therefore toothless. Take Venezuela. Wallace-Wells asked Sanders whether had had considered advocating a more muscular response to Maduro's tyranny than monitoring future elections. After saying that military intervention is not an option, Sanders added, "The world community has got to be mindful of the humanitarian suffering and the hunger that's going on in Venezuela right now. But, at the end of the day, I think what you want in one of the largest countries in Latin America is free and fair elections, and we want to do everything we can to establish democracy there." What a meaningless statement. If Sanders really wanted the United States to do what it could to establish democracy in Venezuela, he would call for concrete action. And that does not necessarily mean a military intervention, but it does mean something—anything—that could make a difference—sanctions, calls for Maduro to step down, and more. But if America is the cause of so many of the world's problems, then American power will only make matters worse. Never mind that the United States—through American power in all of its form, military and otherwise—has been the greatest proliferator of freedom, democracy, and prosperity in the history of civilization. Sanders derides the very tool most capable of bringing his vision to fruition, and thus, his presidency would ensure that authoritarianism around the world would prosper, not wane. There is a better dichotomy by which to define the great threats of the 21st century, but it is not based on authoritarianism; rather the split is between those who support the American-led world order and those who do not. Three factors—an open global economic system, international institutions, and liberal values—define this order, which perpetuates norms that make international conduct and behavior more benign. Not everyone who supports this order is necessarily democratic, however. America's authoritarian yet strategic friends and allies—such as Saudi Arabia, among others—also support the order, because it is in their interests. Sanders's framework (and to some extent Kagan's) does not address this category of countries, which are crucial to American foreign policy. It is too idealistic and ambitious to advocate an American foreign policy that actively tries to make every country into a liberal democracy. But supporting and strengthening this order—which, critically, is also based on American global supremacy—is as close to doing so as practically possible. This idea is the framework for fighting authoritarianism, understanding that not all authoritarian regimes are created equal. This notion is of course anathema to Sanders, since it is fundamentally about America exerting its influence abroad. But Sanders does not recognize this truth, for he is too busy trying to build a new, progressive world order based on "shared prosperity" and narrowing the income gap. Call me crazy, but that kind of sounds like exporting quasi-socialism. Perhaps Sanders picked up a few things while honeymooning in the Soviet Union. This entry was posted in National Security and tagged Bernie Sanders, Foreign Policy, Progressive Movement. Bookmark the permalink.